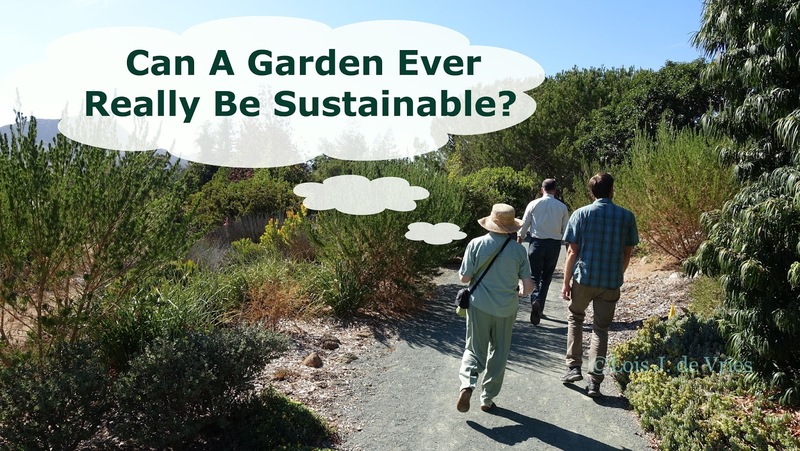 Can A Garden Ever Really Be Sustainable? Well, that depends on our definition of sustainable gardening, doesn’t it? The short answers are no, and no. Why? When we say a system is “sustainable,” we imply that it will stay the same without additional inputs of whatever keeps that system running. Look out the window. If you took a two-month vacation in high summer, how would your garden look when you came home? Without someone to take care of it while you’re away….. If it would be a disaster, with brown grass, shrubs dropping their leaves, and perennials fried to a crisp, plants defoliated by insect pests, or decimated by disease, then your garden is not very sustainable. If, instead, it would look pretty much the same as when you left, except that it would be less tidy and everything would seem to have grown six inches, then it’s more sustainable. Gardens are human-manipulated collections of plants (designed landscapes).We haul in soil amendments, build up earth where there is none, construct retaining walls, terraces, and steps so that we can plant on steep slopes, lump together plants that originated on separate continents or in distinctly different ecosystems, alter the flow of ground and surface waters, and more. Gardeners (and garden designers) who have a refined eye for composition and color can produce stunning results on even the most modest and unpromising of city lots. But at what cost to the ecosystem, and for how long? The carrying capacity of any piece of land is determined primarily by the type of underlying bedrock and soils, the availability of surface and underground water, climate, and whether it has been previously disturbed (such as by mining, clear-cutting, periodic flooding, etc.). This is the foundation that underlies the very thin surface layer of the Earth, that we occupy. But other, complex elements, such as environmental sensitivity, size and type of the natural biotic community, etc., play an important role, as well. The more closely a garden approaches the carrying capacity of its specific site, the less sustainable it becomes and the more inputs (soil enhancers, water, pesticides, etc.) it requires to maintain. A garden dies when its gardener dies – or moves away. Left on its own, it will revert to its regional environment, which is determined by those foundational components. They, in turn, determine what plant, insect, bird, herptile, and mammalian communities can thrive there, including both native and exotic species. There is a natural succession of these biotic communities that takes place over time. That’s why, for example, unmaintained natural ponds become swamps or marshes, then shrub-scrub swamps, then forested swamps or grasslands, and ultimately, dry forests. Nature doesn’t stand still. Even within well-maintained gardens, some version of natural succession occurs. A dogwood sapling planted a decade ago begins to shade out the adjacent lavender garden. The combination is not sustainable over the long term. Either the dogwood will need to be continually pruned or the lavender will need to be replaced with something more shade-tolerant. Similarly, tree canopies eventually close, creating full shade where once there was abundant sunshine; severe weather may destroy a closed canopy, exposing shade plants to blistering solar glare. To be 100% sustainable, a garden would have to be a closed system. Plants, fertilizer, soil amendments, water, insect and disease control, etc., would all need to be managed from inside the garden. For example, composting plant waste to provide soil amendments; applying properly aged manure as fertilizer; raising chickens or guinea hens to hold down the insect population; building cisterns to store rainwater for irrigation, etc. If you think that’s starting to sound like a miniature farm, you’re right. And rare is the homeowner who is willing to do what it takes to create and maintain this type of garden. But wait! There’s a better way. Stay tuned to find out how you can garden more sustainably without a lot of back-breaking work.